Photo: University of Southern California. USC plays doormat Arkansas State in its season opener Saturday night at the unusual time of 8 p.m. local time at the Expo Line-adjacent Los Angeles Memorial Coliseum. UCLA opens their season against creampuff Virginia at 12:30 p.m. in Pasadena at the Rose Bowl, which can be reached via the Gold Line and a free bus shuttle near the Memorial Park Station. The Expo Line will run every six minutes before and after the game –as usual on Saturday nights, all Metro Rail lines and the Orange Line will run until 2 a.m. The Gold Line will be running every seven or eight minutes during the day Saturday. 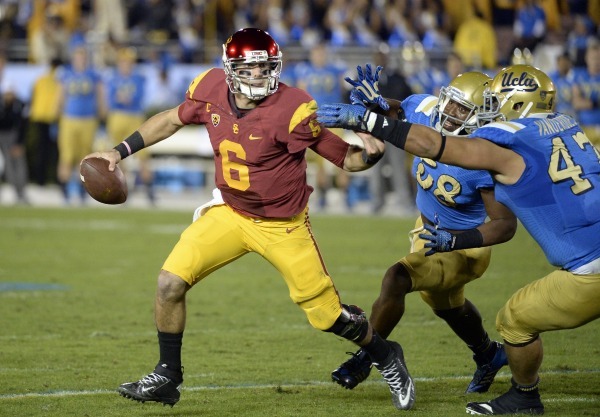 USC is ranked eighth and UCLA ranked 13th in the preseason Associated Press poll. It should be a pretty exciting college football season as both teams vie for a spot in the playoffs on Dec. 31 at the Cotton Bowl in Dallas and Orange Bowl in Miami. 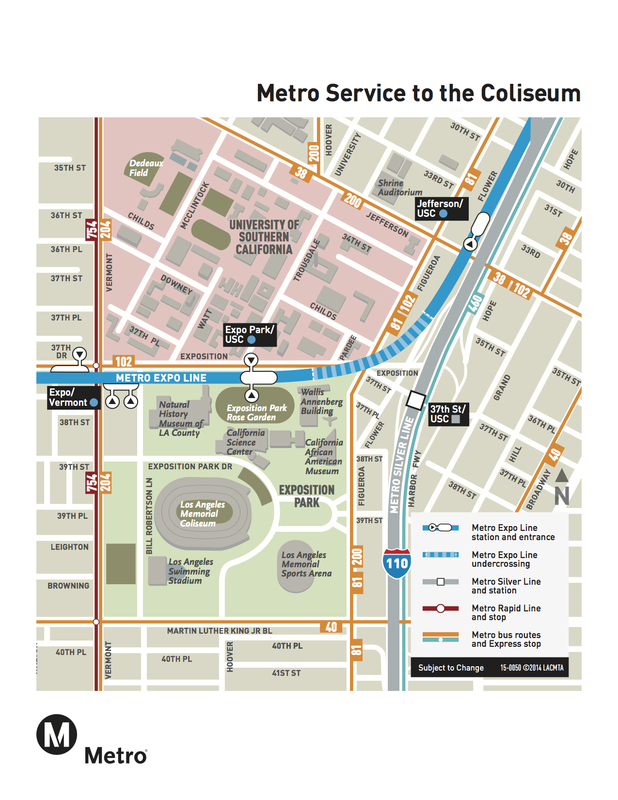 Please note that Metro will be running extra service for each of the USC games this season. The Gold Line already runs more frequently most of the time. I encourage fans to consider the transit option as parking at the Rose Bowl and Coliseum can be a very, very expensive proposition — not to mention the aggravation of sitting in traffic. Fares are sold on TAP cards; buy them at TAP vending machines at Metro Rail stations or from a Metro representative. Tip: Load your TAP card with $3.50 round-trip fare in advance to avoid waiting in line. It’s a fairly quiet evening around town on Saturday big event-wise. The Dodgers are out of town Saturday night but there is an 8 p.m. Chayanne concert at Staples Center. Referring to opponents as ‘doormats’ and ‘creampuffs’ is a sure way to jinx the outcome. It’s your fault, Steve :-). BTW unless you know a friendly student, general admission tickets are $45 (USC) and $33 (UCLA) respectively. Talk about inflation! 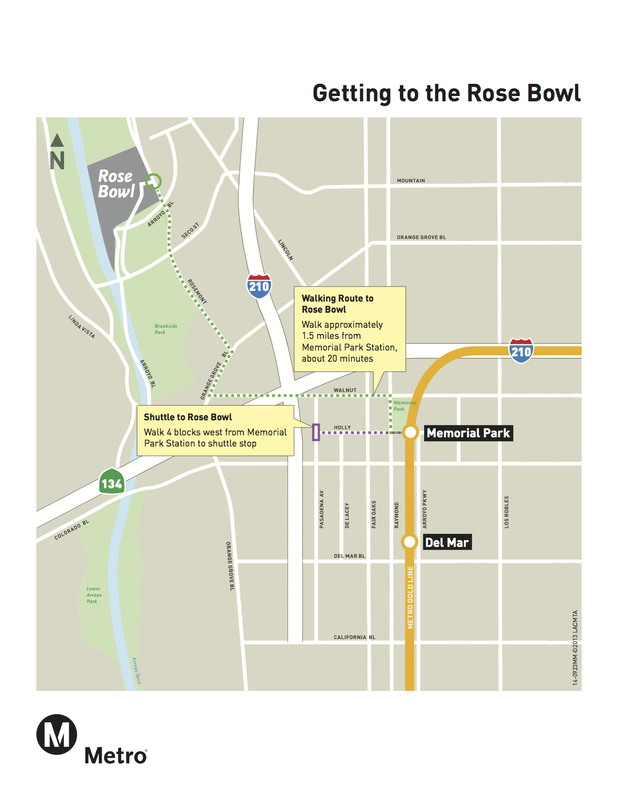 That free shuttle to the Rose Bowl runs from the Parsons Corporation ‘game overflow’ parking lot, see uclabruins.com for details. Return long walk uphill – not recommended unless you crave the exercise. Luckily for me, my footballian affiliations are located back east, thereby giving me the space to show there are no such things as jinxes. Then again, if a government blog can manage to determine the outcomes, I’m gonna Marty McFly straight to Vegas. In fact, I have a better chance of getting there in a DeLorean than a train. Grump.